Striker Ashley Barnes’ shoulder injury is not as bad as was suspected. The 10-goal frontman was forced off early in the game with Arsenal at the Emirates Stadium on Sunday with a suspected dislocated shoulder, sustained in a collision with the Gunners’ Swiss midfielder Granit Xhaka. Boss Sean Dyche said afterwards: “We’re waiting to find out – it’s shoulder/collarbone, but we’re waiting to find out an accurate view of it. 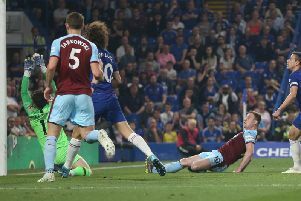 The 28-year-old missed Monday night’s Player of the Year Awards at Turf Moor after the injury, and he is likely to miss the last game of the season at home to Bournemouth on Sunday, as the Clarets round off a remarkable season which has seen the club earn a return to European competition after an absence of half a century. But I understand it has been diagnosed as a minor injury to his collarbone ligaments, rather than a dislocated shoulder, which would have put him at risk of missing the start of the new season. Dyche will also wait on Barnes’ strike partner Chris Wood, who is also on 10 goals in all competitions for the season. Wood missed the 5-0 reverse at Arsenal after sustaining a cut to his foot which required stitches, during the goal-less draw with former club Brighton the previous week. And Ben Mee will also be assessed, having sat out the last six games with a stress injury at the bottom of his shin. Should Scot Arfield shake off a calf niggle, he and Dean Marney could both feature at some stage as they prepare to move on in the summer as their contracts expire. Arfield is set to make a move to boyhood club Rangers, while Marney, who has spoken to Nottingham Forest boss Aitor Karanka, will assess his options. While Burnley’s season comes to an end on Sunday, it won’t be long before they are back in action, with a shorter summer than expected. The draw for the second qualifying round of the Europa League, at which stage Burnley will enter, will take place in Nyon on June 19th. The two-legged tie will then be held on July 26th and August 2nd.